Hurricane Harvey was and is far more than just a devastating hurricane and news story. It really impacted our ARC® community, including both employees and customers. My company, ARC, has 123 employees in the Houston area, 27 of whom suffered major property losses. Fortunately, none of our team was hurt. But, there are harrowing stories of near electrocutions and boat rescues. This is real! How would ARC respond? How could / should ARC respond? I called one of my team members the day after his total loss forced him into a temporary hotel and he told me he was on the phone with customers that day making sure he followed up on his responsibilities. I knew we took customer service very seriously, but this was going above and beyond. While I appreciated that commitment, I wanted to make sure he and his family were safe and being taken care of. I asked him how he was able to get his hotel through FEMA so quickly. He was one of the few people who had his lease digitized and available on his cell phone, so it was a fast process with FEMA. Smart! ARC’s team was also impacted when Hurricane Katrina devastated New Orleans more than a decade ago, and we learned a lot. John Zulli, who is on our executive team, was born and raised in New Orleans. John and our CEO, Suri Suriyakumar, implemented a lot of team support initiatives based on our past lessons learned from Katrina. Food and housing would likely be taken care of by the National Guard and relief organizations. Most people would need housing, transportation, clothing, air mattresses, bedding, cooking utensils, money and ultimately, a path to get back to work and return to semi-normalcy. We put these plans into place immediately. Communication was key. While our company did many wonderful things for our impacted employees, it was the overall support of ARC® employees that was amazing. 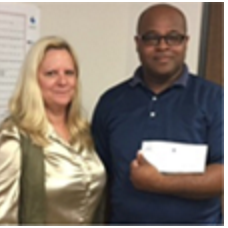 They have come together to raise over $23,000 for employees in the Houston, Texas area who were affected. In support, ARC has matched every donation dollar-for-dollar. Separately, ARC® pledged $50,000 worth of consultation services to get Facilities teams up and running again. How is a facilities team supposed to recover from all that property damage? They have to get their business back up and running. What if their building and facilities documentation, including floor plans and operating manuals, were damaged or lost? Our team of experts will help them. Recovering from a catastrophe takes a community, and the ARC family has generously responded with support — not just financially, but also with empathy and kindness. Hundreds of ARC employees donated to the YouCaring donation site, shared their stories on LinkedIn and Instagram #lifeatarc to spread awareness of the rebuilding effort. Last Wednesday, the first round of checks was distributed to eleven people who had suffered significant losses. Days like these make me proud to be part of such a great group of people, so I wanted everyone at ARC to see the impact they had. Here are a few excerpts from thank you notes we’ve received in recent days. As most of you are aware, my family and I were devastated by Hurricane Harvey. For two weeks we weren’t able to enter our townhome which was 7 feet underwater. We had to move three times in three weeks only escaping by bike with laptops, phones, and 2 change outfits. Today we are standing tall again and rebuilding. ARC employees relentlessly provided assistance in such a big way that I don’t know how I could properly say thanks from the bottom of my heart. A couple of friends commented on how they were treated by their employers post Harvey and were extremely impressed and envious of all the love and support that ARC has provided. My family and I sincerely wants to thank ARC for all the generous donations and thoughts that have assisted in our recovery. I was fortunate, it wasn’t as bad as it could have been, there was many others that had a lot more damage than I, and some that even lost their homes. Keeping this in mind, and having my faith to keep me strong, it was still an emotional roller coaster of devastation, depression, frustration, and even anger. After I was able to return to work, ARC handed me a gift card that helped a lot with groceries and cleaning supplies. It was so heartwarming to see how the company I worked for, stepping up to help all those affected by the storm. All the phone calls from HR, managers, Mark Gerick, checking to see if we were ok, and needed any help! All the donations from ARC and employees! 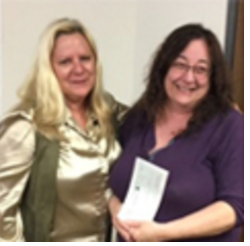 Yesterday, September 12th 2017, I was called into Cyndi and Dorothy’s office, and to my surprise, I was given a check from ARC, I broke down in tears. Not knowing how I was going to replace my kitchen, this money will be put to good use, I promise you all that!! Thank you just doesn’t seem enough, but thank you all from the bottom of my heart!! He tore our homes right out from under our feet with devastating flood water. Harvey left destruction- beyond anything, words could describe. He leaves some of us homeless, blind in the dark with flood water up to our waist, shivering in the waist high murky water and we didn’t have a chance to save our treasures, pictures, and automobiles. However, we stand here now on a new day and our hearts are filled with joy from the generosity and support that our ARC team has assist us with during these tragic times. We are thankful that material things can be replaced but our lives were spared to continue to do good deeds and works. We will continue to Be Hopeful, Be Resilient, and Be Prayerful for everyone that has been affected by Hurricane Harvey. 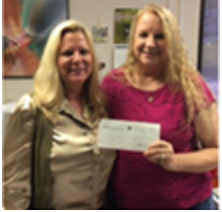 You can only imagine how happy we were to receive the generous relief donation from ARC and Associates. You are so thoughtful and generous! I wanted to take a few moments and express my gratitude for the outpouring of concern, support and financial assistance from all of ARC. I saw Region 3 management and employees out in the flood waters rescuing people and delivering vital supplies to our employees. It is heartwarming to see a company you work for take such extreme measures to take care of their people. We are a family and families pull together. The added blessing of financial assistance that came from the company and the many employees who gave to help. This was such a blessing and was extremely appreciated. It is great feeling to say I work and belong with such a generous team of people. Wanda, Jervis and Cyndi weren’t the only ones ARC employees helped. The generous donations also helped out (pictured below) Jo Nell Johnson, Charles Gilbreath, Dominic Gonzales, Maria Davila, Joann Calabrese, Evetta Gray, and Jon Williams. Many other ARC employees and customers were impacted by Hurricane Irma in Florida as well. What a tough year. You really can see what people are made of during tough times. I spoke with Ben Pursell today. 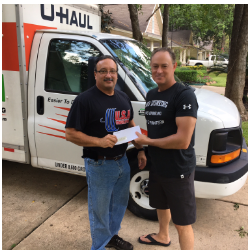 Ben is one of our employees in Houston who fortunately didn’t suffer damage from Harvey. He said he and his wife are doing about 80 loads of laundry a week for friends and neighbors who were impacted. Ben said he has never been prouder of Houston or felt more engaged with his community. 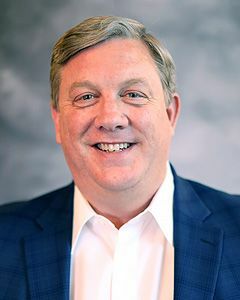 Brian brings 20+ years of software industry experience to ARC, driving innovation in the SaaS space for companies such as HootSuite, MarketShare, Socialtext, and ThomsonReuters. He holds a Bachelor's of Science in engineering from Stanford University and MBA from Harvard Business School.